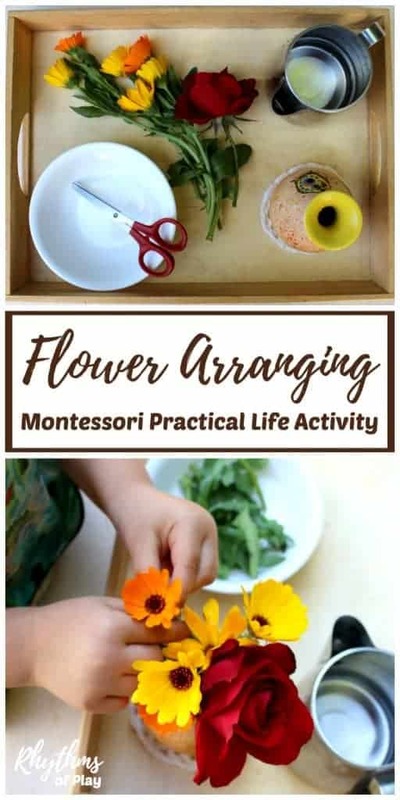 Flower Arranging and other Montessori practical life activities are used to help children begin to develop independence and logical thought. Practical life activities, like arranging flowers, can also create positive lifelong habits when practiced regularly over time. In Waldorf education, these types of activities are referred to as home life skills and are practiced within the rhythm of daily life in both the home and the classroom. Maria Montessori developed practical life activities to help children develop into independent thinking adults. Each step in a practical life activity satisfies the child’s innate desire to imitate the home life skills that children see adults perform around them on a daily basis. Other practical life activities include pouring, transferring materials, cutting a banana, squeezing an orange, folding washcloths, etc. 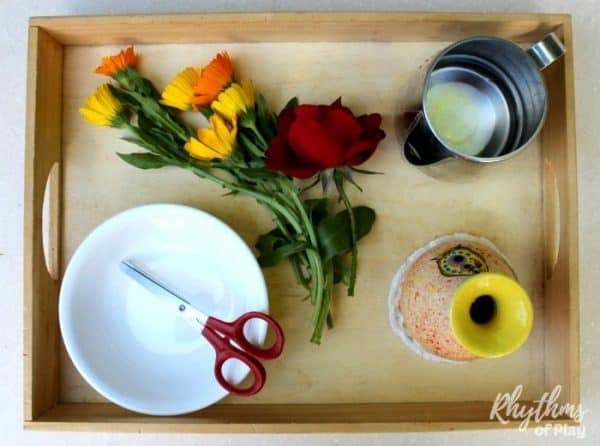 Flower arranging includes a number of home life activities, so it is best for kindergarteners, preschoolers and older toddlers who have had a lot of experience with skills such as carrying a tray, pouring, and using scissors for cutting. Pick or purchase flowers to arrange. Place doilies , flowers, discard bowl, scissors, a pitcher of water, and a vase on a wooden tray or on a Montessori activity mat . You will first need to demonstrate how to arrange flowers if this is the first time your child has ever tried flower arranging. Young children learn best by imitating others. 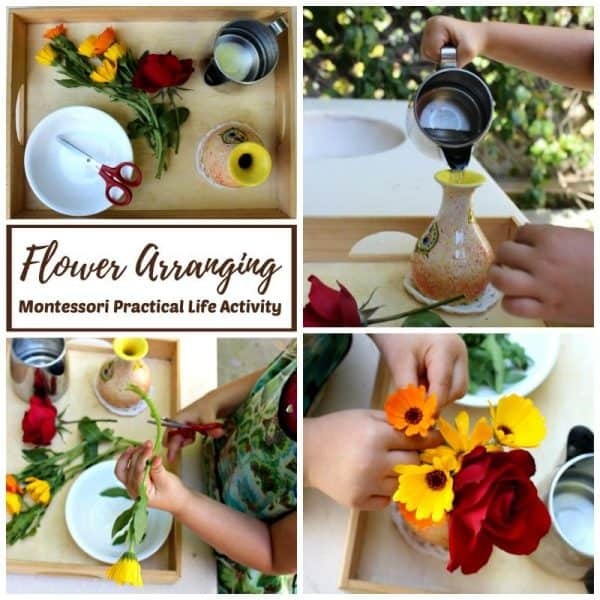 Show your child how to arrange flowers by completing the activity step by step exactly how you want it to be done, and describe what you are doing as you work. 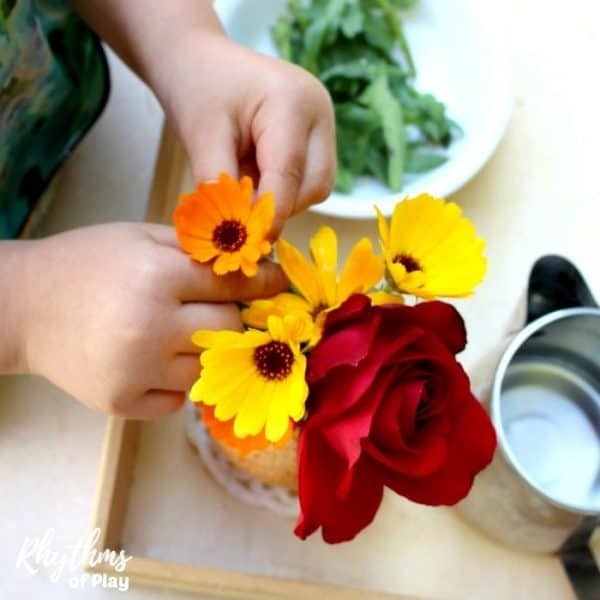 When you are finished with your demonstration invite your child to arrange flowers and complete the activity following the step by step flower arranging directions below. Montessori recommends that all practical life activities proceed from left to right, and top to bottom like we read from left to right, and top to bottom to help create the habit of going from left to right, and top to bottom–whew!! Oh my goodness that was a mouthful! Montessori believed that creating strong habits like going from left to right, and top to bottom (I know, I can’t believe I said it again either!) would pave the way toward literacy, prepare the child for reading and writing, and produce competent and successful students. Putting an apron on starts the activity cycle so that the child knows that it is time to work. Maria Montessori developed the activity cycle to help build the positive habits that children need to become successful students, and later, successful adults. Putting an apron on, or placing an activity mat down, is the cue to the child that it is time to work. Over time the whole child (brain, body, and spirit) will respond to this cue and be prepared for the job at hand. Place the flower arranging tray or activity mat in front of your child. Use a glass or metal child sized pitcher to pour water into a small vase . My daughter likes to work outside on her DIY Art Table & Mud Kitchen. Stand the flower next to the vase to determine the amount that needs to be trimmed. Use a pair of scissors to trim to the desired length and place the trimmings in a discard bowl . 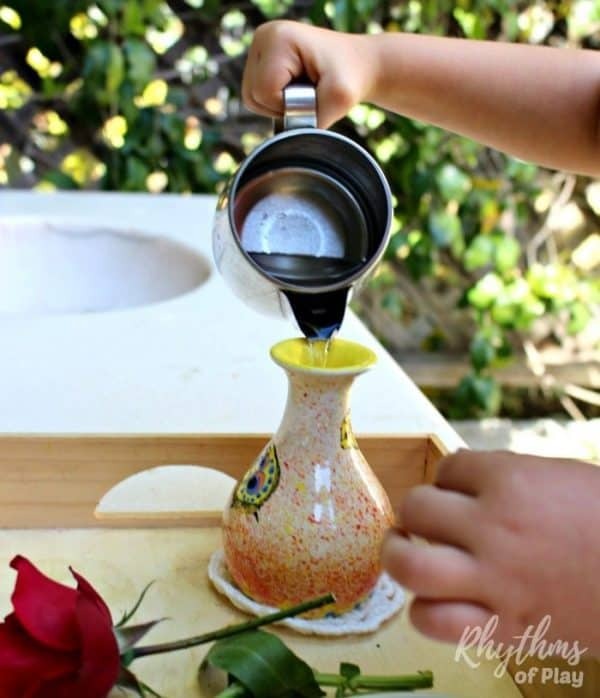 Have your child trim and place each of the flowers into a vase until the activity is complete. Invite your child to place their flower arrangement somewhere in the home. This can create good habits and help your child feel like a valued contributor to the household. Clean up and put everything away. In our house, that means placing the flower trimmings in the compost bin and placing the tray with the pitcher on the kitchen counter. Have your child take their apron off and hang it up. Do your best to abstain from moving your child’s arrangement. Admire it as is! Below is a photo of an arrangement my daughter placed one day. I wanted to turn my daughter’s beautiful flower arrangement around to face the room, but that would have disturbed her work and put less value on it so I left it. 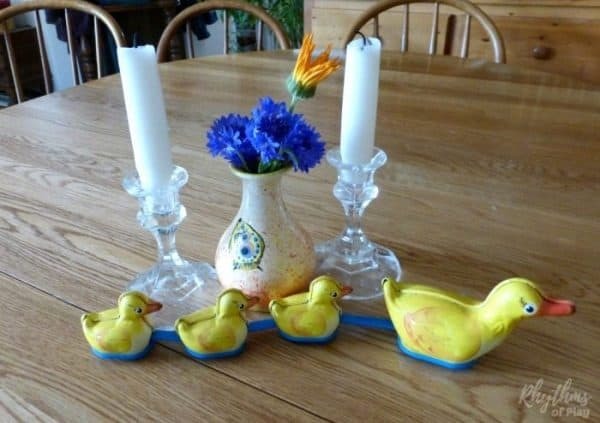 The ducks are my favorite… You gotta love kids! Montessori practical life activities are designed to help children develop logical thought and independence. 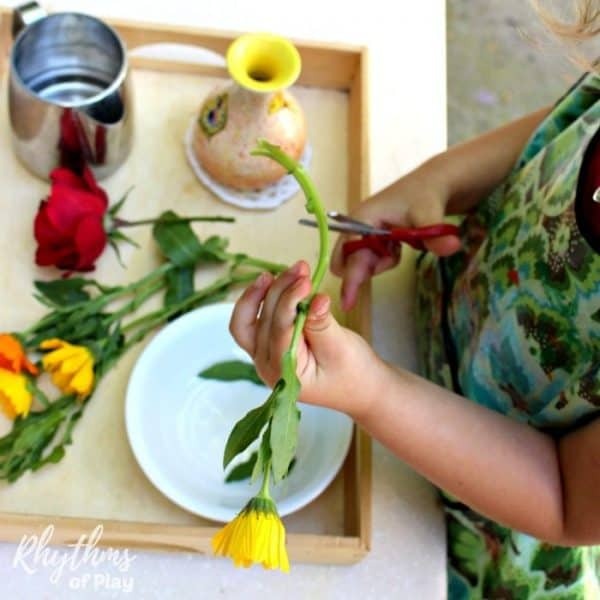 Flower arranging contains several home life skills important for a young child to learn and master including pouring, measuring, cutting, placing, and carrying!